I was desperate for a fruit pie to stack between the pumpkin, pecan, and a weird-o oatmeal one that I planned to round out the year, but there was no fruit, none, at my local farmers market. No fruit, that is, except persimmons. They scare me a little. There are so many varieties, and what you can do with them changes dramatically based on that. You’ll find tons of recipes that call for persimmon pulp, which you get from really ripe hachiya persimmons. The persimmons I bought looked like fuyu- a variety that you can eat when still hard, so I bought them and planned to dress them up like apples for a take on apple pie. Well they ended up not being fuyus, I found out later. They’re eureka persimmons, which should really be used when they’re slightly soft. If you find yourself with some eureka persimmons, they actually worked pretty well as a substitute for apples, with a few important precautions taken. You’ve got to peel them. You don’t have to peel fuyus, so I didn’t think I needed to peel these, but the skins are outrageously, uncomfortably tough. Also, taste a small slice of every persimmon you’re planning on using in your pie. Underripe ones are bizarrely mouth-drying and chalky. I ended up with one in the mix in my pie and bites with that sad persimmon in it were really unpleasant. Also, they are so so sweet. I mixed in a cup of frozen cranberries with the persimmons to balance out the sweetness and mimic the tartness of apples and it was just right. 2. 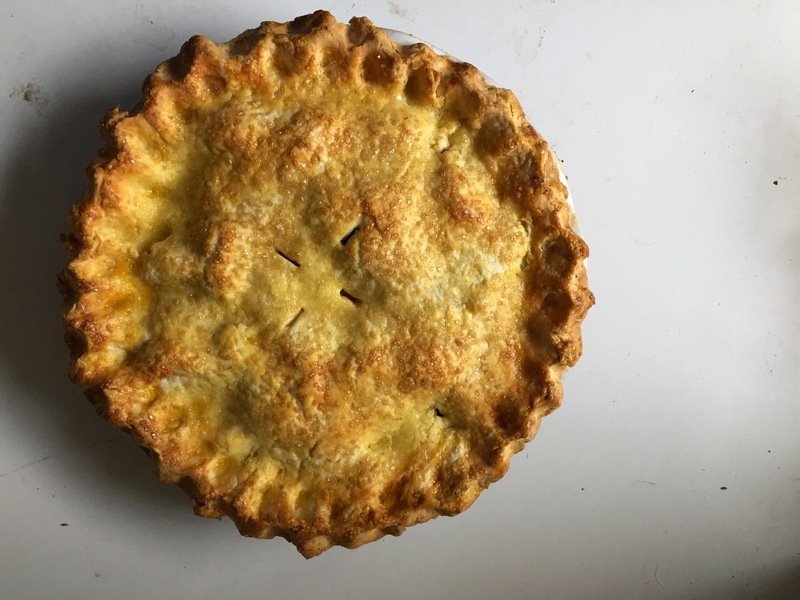 On a well-floured work surface, gently roll out the pie crust into about an 11-inch circle. Press together any spots that might tear. Carefully lift and place into a 9-inch pie plate. Use a pairing knife to trim the edges of pie dough, leaving about 1/2 inch extra dough overhang. Refrigerate while you make the filling. 3. To make the filling, gently toss together the peeled and sliced persimmons, the cranberries, lemon juice, sugar, flour, cinnamon, and nutmeg. 4. Layer the filling in the pie shell, trying to make most of the slices lie flat, and mounding them higher in the center. Roll out the second desk into an 11-inch round and lay on top of the filling, crimping the edges together. Brush with one egg beaten with a splash of water and sprinkle with turbinado sugar. 5. Bake the pie for 15 minutes, then reduce the oven temperature to 350 degrees and bake 45 minutes longer. You might have to cover the pie with foil at some point after the first 15 minutes to keep it from getting too dark, so keep an eye on it. 6. Remove the pie from the oven and let cool on a wire rack. Enjoy!